The CE-91 Plus Feeder Cube is a single controller with parts sensing capability that carries the CE mark. It is housed in a Nema-12 oil resistant enclosure. Declaration of Incorporation provided. Input voltage is 120VAC, 50/60 Hz. It is fused for 15 amps. 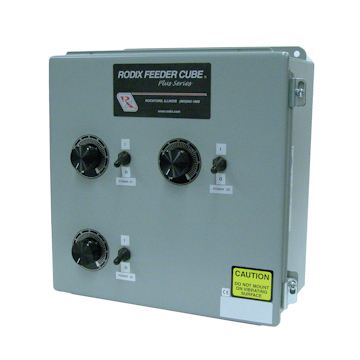 The CE-91-2 Plus Feeder Cube is a dual controller with two parts sensing units, housed in a Nema-12 oil resistant enclosure. The controller carries the CE mark. Input voltage is 120VAC, 50/60 Hz. Unit A is fused for 15 amps and Unit B is fused 5 amps. Declaration of Incorporation provided. 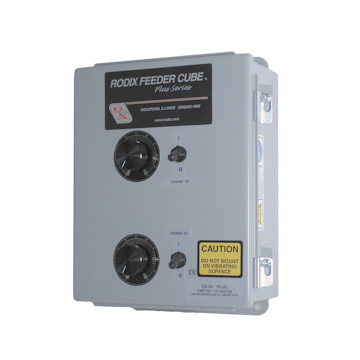 The CE-93 Plus Feeder Cube is a dual controller with parts sensing, housed in a Nema-12 oil resistant enclosure that carries the CE mark. Input voltage is 120VAC, 50/60 Hz. Unit A is fused for 15 amps and Unit B is fused for 5 amps. Declaration of Incorporation provided. 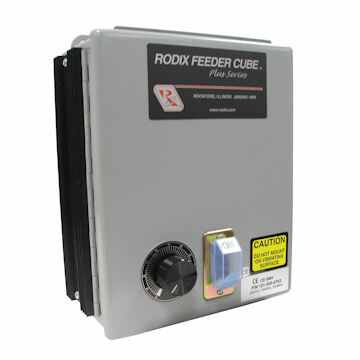 The CE-98 Plus Feeder Cube is a single controller with parts sensing capability that carries the CE mark. It is housed in a Nema-12 oil resistant enclosure. Declaration of Incorporation provided. Input voltage is 240VAC, 50/60 Hz. It is fused for 8 amps. The CE-98H Plus Feeder Cube is a single controller with parts sensing capability that carries the CE mark. It is housed in a Nema-12 oil resistant enclosure. Declaration of Incorporation provided. Input voltage is 240VAC, 50/60 Hz. It is fused for 15 amps. 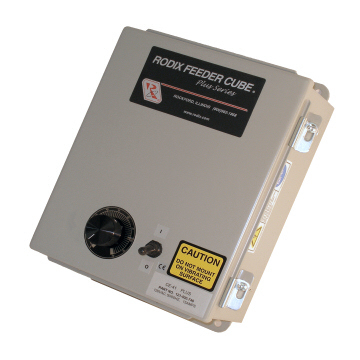 The CE-98-2 Plus Feeder Cube is a dual controller with two parts sensing units, housed in a Nema-12 oil resistant enclosure and carries the CE mark. Input voltage is 240VAC, 50/60 Hz. Both Unit A and Unit B are fused for 8 amps. Declaration of Incorporation provided. The CE-103 Plus is a triple controller in a Nema-12 oil resistant enclosure that carries the CE mark. Unit A (4 amps) and Unit C (1 amp) are 40 Plus Series controllers. Unit B (15 amps) is a 90 Plus Series controller with parts sensing. Input voltage is 120VAC, 50/60 Hz. Declaration of Incorporation provided. The CE-99 Plus Feeder Cube is a dual controller, housed in a Nema-12 oil resistant enclosure with parts sensing that carries the CE mark. Input voltage is 240VAC, 50/60 Hz. Both Unit A and Unit B are fused for 8 amps. Declaration of Incorporation included. The CE-109 Plus is a triple controller in a Nema-12 oil resistant enclosure that carries the CE mark. Unit A (8 amps) and Unit C (1 amp) are 40 Plus Series controllers. Unit B (8 amps) is a 90 Plus Series controller with parts sensing. Input voltage is 240VAC, 50/60 Hz. Declaration of Incorporation provided.